The Gypsy moth is one of the most obnoxious pests in the US today, capable of decimating whole forests. So of course the government wants them eradicated. But so potent is the virus they use to control them that it makes them suicidal and melts their insides. The virus is known as baculovirus, and it's wicked stuff. 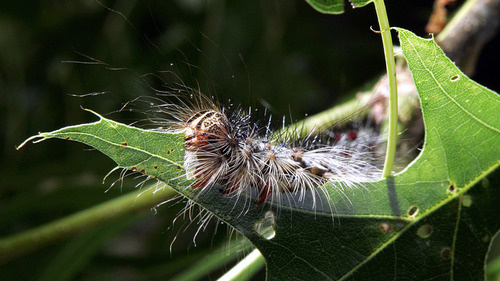 When exposed to the virus, the Gypsy moth caterpillars begin to behave erratically, climb up to a high part of the tree they live in, and eventually die. It doesn't end there though. The virus breaks their bodies down from the inside out, melting their organs down until there's nothing left but caterpillar goop. Brutal. But that's not the evil genius of the baculovirus, and why it's so attractive to officials who want the pest dead and gone. The virus actually controls this behavior on a genetic level in order to propagate itself. By activating the caterpillar's gene responsible for molting behavior, it convinces the creature to crawl high up in a tree and stop eating. Once it dies, the melted remains drip down onto the leaves below for other caterpillars to eat, eventually infecting the whole population. It's like an honest to goodness zombie movie, but with bugs. Correction: Baculovirus. No. This has nothing to do with Scott Bakula. Thanks guys.